Someday I'll Sleep Autism Blogs: Bishop of the Week: Cardinal Raymond Burke Given Greater Responsibility! 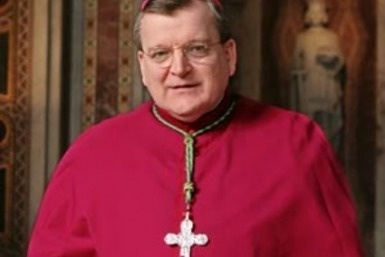 Bishop of the Week: Cardinal Raymond Burke Given Greater Responsibility! Moving is stressful enough without focusing on the disgusting display of heterodox "Catholic" politicians receiving the Eucharist (okay, I really trying not to focus, despite the brief mention). As a result today I went looking for happy Catholic news and I found something that has me grinning from ear to ear. Paul saw it first and then I stumbled upon it over at California Catholic. "Cardinal Raymond Burke, former Archbishop of St. Louis and current prefect of the Supreme Tribunal of the Apostolic Signatura, the Church’s ‘supreme court,’ has been given even more responsibilities by Pope Benedict XVI. According to the Vatican Information Service, the official news agency of the Holy See, Cardinal Burke, well known for his orthodox views, was named by the Holy Father on Dec. 29 as a member of three important congregations of the Roman Curia. They include the Congregation for Bishops, the Congregation for Divine Worship and the Discipline of the Sacraments, and the Pontifical Council for Legislative Texts. The addition of Cardinal Burke to the Congregation for Bishops could be significant for the Church’s future. The Congregation is the curial office responsible for assisting the pope in the selection of new bishops..."
I'm a few days late in discovering this wonderful news (blame it on the move and our lack of internet and phone until yesterday!) so many of you have probably already heard it, but this makes my day a little brighter. Now back to scrubbing and unpacking. I think I prefer scrubbing to unpacking actually. Unfortunately there are still quite a few more boxes to sort through. It's amazing how much "stuff" accompanies babies and toddlers!